My first drawing of 2016! Took me a while to get going this year because I had five book releases during February and March, and they have kept me busy in recent weeks. 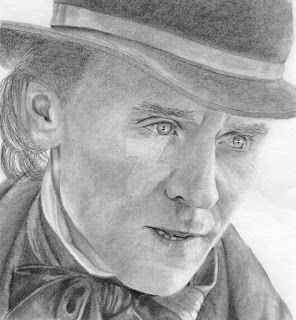 I've been meaning to draw Tom Hiddleston as Thomas Sharpe in Crimson Peak for a while, but I struggled to find an image that wasn't too dark from which to work. Finally, I came across this one. The expression of his mouth was a little awkward, but I did my best with it.